Shares slipped as cryptocurrency values declined. E-commerce retailer and blockchain specialist Overstock (NASDAQ:OSTK) trailed the market by losing 18% last month compared to a 3% increase in the S&P 500, according to data provided by S&P Global Market Intelligence. The decline added to a tough year for the stock, which had been up by over 200% at one point in the last 12 months but is now just barely beating the market's 17% gain over that period. Investors initially reacted positively to the company's second-quarter results that paired bad news in its retailing business with encouraging progress in the blockchain segment. The e-commerce division is ending its attempts to aggressively accumulate market share in favor of producing higher profits, management said. On the other hand, Overstock's blockchain subsidiary continues to attract capital and interest from outside financiers. 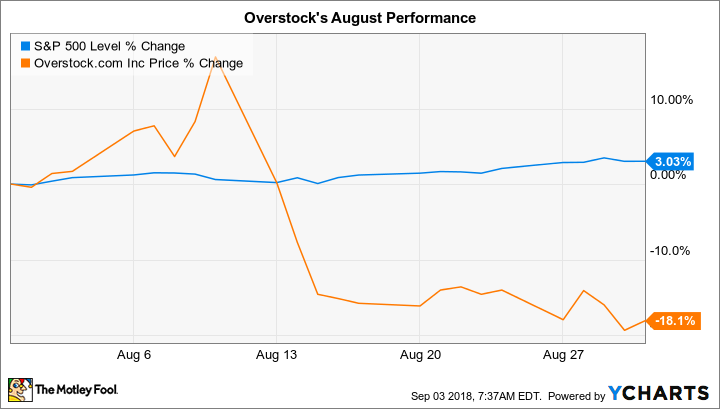 Yet Overstock shares ultimately followed the path of most cryptocurrencies lower during the month. Overstock executives are looking for buyers for its retailing business so that the company can turn its focus toward its blockchain investments. It might be hard to find a good price for the home furnishings segment, though, given its weak sales and profit trends. In the meantime, investors can expect Overstock shares to stay volatile as they track the shifting sentiment around cryptocurrency valuation.